Learning to abseil is fun and a great way to enjoy the outdoors. 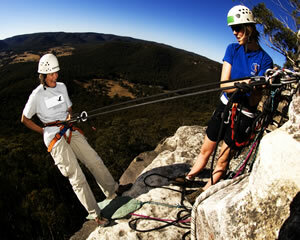 Abseiling courses are available all across Australia in some of the most beautiful locations imaginable. Abseiling lessons teach you the technical skills needed to abseil and you then practice these skills before your first abseiling adventure. 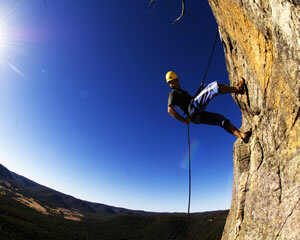 Abseiling in Sydney is best in the Blue Mountains and Katoomba. 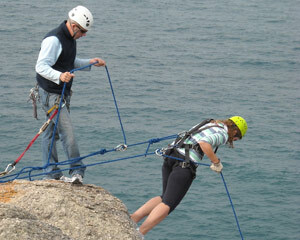 However, abseiling in Brisbane, Adelaide, Perth, Hobart and Melbourne is very popular. 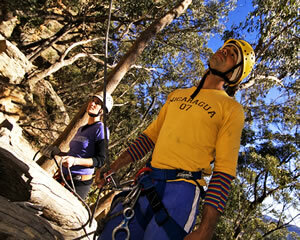 Learning to abseil or abseiling courses are available all across Australia and they make perfect gifts. Abseiling courses are available for all levels from beginner to advanced. Abseiling is exciting, safe and abseiling lessons get you ready to take on the steepest of inclines. Of all the rock sports, abseiling is probably the most exciting to watch, yet one of the easiest to learn. An exciting way to engage your team, learn a new skill and have fun! Invite your group to see the Blue Mountains - and one another - from a totally new and outrageous perspective! Take the dare and go Off The Edge! A day of awesome flying foxes, giant rope activity, abseiling and climbing for all fitness levels. Go abseiling in the Blue Mountains! 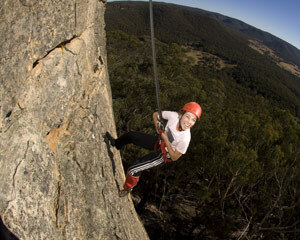 Check out the world-class views and rappel down a classic Australian rock face. Conquer great heights, and your fear, in the hands of experienced, friendly professionals. Find your inner adventurer on a Blue Mountains cliff - there's nothing like the air up there!